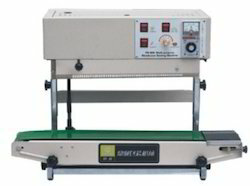 Manufacturer of a wide range of products which include continuous sealer, ss horizontal sealer, continuous band sealer, ss vertical sealer, plastic pouch sealing machine and mini conveyor sealing machine. 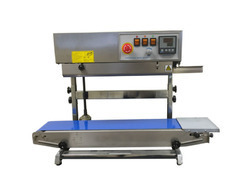 From the day of commencement, we are engaged in catering to the variegated requirements of the customers by bringing forth a commendable range of SS Horizontal Sealer. Our product line is used in various industries for packing purposes, designed specifically under the supervision of our experienced team of professionals to bear heavy work pressure at our vendors base. 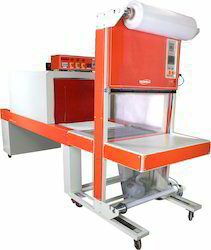 Being one of the leading manufacturers and supplier of this quality Continuous Band Sealer Machine, we never compromise with its quality. Thus, we engage in the using quality raw materials and modern machines, as per the set industry norms and guidelines. Owing to this, the offered product is characterized by high functionality, resistance to corrosion, superior strength and an unmatched service life. 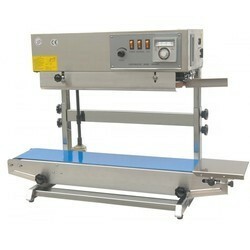 Continuous Band Sealer To seal different types of prefilled flexible bags continuously. Applications in various industries like food packaging, chemicals packaging, packaging of engineering and industrial items etc. With the enormous support of our deft team of professionals, our organization has came up with a wide range of SS Vertical Sealer. 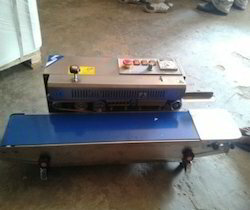 These machines are used in various industries for sealing or packing of pre-filled pouches of various products, owing to their excellent performance and long service life. Keeping in the mind the variegated places where these products are used, we offer this range in various designs and sizes as par the requirements of our clients. Sealing speed 10 or 12 metre/min. 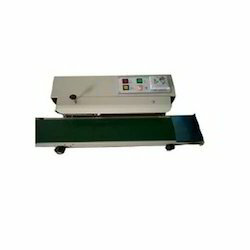 We are the manufacturer of Mini Conveyor Sealing Machine. Being one of the leading manufacturers and supplier of this quality Pouch Sealing Machines, we never compromise with its quality. Thus, we engage in the using quality raw materials and modern machines, as per the set industry norms and guidelines. Owing to this, the offered product is characterized by high functionality, resistance to corrosion, superior strength and an unmatched service life. 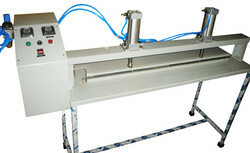 Pouch Sealing Machines To seal different types of prefilled flexible bags continuously. Applications in various industries like food packaging, chemicals packaging, packaging of engineering and industrial items etc. We are fully devoted in exporting and manufacturing premium quality Web Sealing Machine. These machines have gained much acceptance among our clients, owing to their effective performance, resilient design and user friendly control mechanisms. Due to their fabrication from premium grade material with latest machines, these machines are widely used in bottling plants. In addition to this, wide stipulations of these machines are available with us, which we offer at equitable rates for clients.